Among all the things to do in Uganda, Gorilla Trekking definitely stands out! It is hard to describe the feeling of standing just metres from an immense, wild silverback gorilla and listening to the deep groans of one of our closest relatives. The jungle-clad slopes of Uganda’s Bwindi Impenetrable Forest are one of just a few places in the world where you can trek for an up-close experience with these gentle beasts. In this protected slice of forest (and the slopes of the Virunga Volcanoes to the south which straddle the borders of Uganda, Rwanda and the Democratic Republic of Congo) are the last remaining families of Mountain Gorillas. Years of poaching and habitat destruction have left their numbers seriously threatened and it is only the tourism economy which now ensures their survival. My journey to visit the Mountain Gorillas of Bwindi began on the shores of Lake Bunyonyi in the far west of Uganda. It was in this spectacular landscape of rolling hills, patchworked with crops sloping down to the tranquil lake waters, that we were briefed for this adventure – the gorilla’s location could not be guaranteed and we may need to walk two hours or ten hours….or we may not see them at all. We departed early morning in jeeps to the park administration of Bwindi where our guides and kalashnikov-wielding ‘scouts’, dressed in olive-green camouflage, waited. Gorilla tourism has transformed the local economy here, converting many poachers into protectors, and the guns would only be fired in warning if an animal threatened. The trails of Bwindi were thick with mud, sloping steeply up and down through this rugged terrain. The dense jungle canopy, heavy with humidity, reverberated with a cacophony of bird calls which provided a constant soundtrack as we trekked ever deeper. Two hours went by…three hours…but no gorillas were to be found. Our guide’s radio crackled to life every few minutes and an indecipherable Bantu was heard from the scouts who had ventured ahead to locate the animals. ‘We are getting closer’ he reassured us, but the anticipation which had energised many that morning waned as weariness kicked in. Then he motioned for us to stop and indicated silence with a finger to his lips. 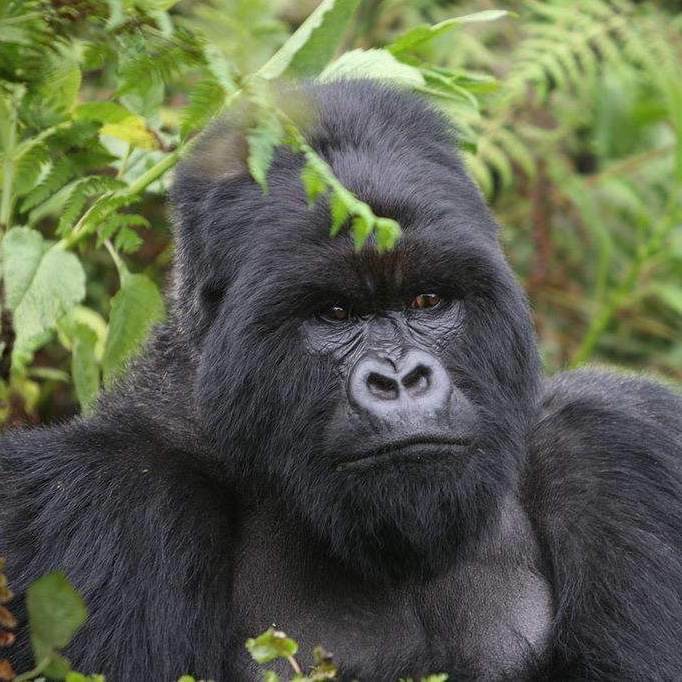 Amidst the bird calls came soft, heavy grunts – gorillas. We followed the sounds of foliage being broken as the gorillas fed and slowly one, then another, emerged from the dense greenery. Before us was a whole family of mountain gorillas – babies clinging to their mothers, young playfully testing their limits, and the commanding silverback asserting control over his domain. Restrictions limit both the distance you can be to the gorillas and the time you are allowed to spend with them but it is close and long enough to get exceptional photos and videos of this encounter. A set of binoculars is highly advised to get up-close views of facial expressions and those in the distance but allow yourself plenty of time to view the gorillas with your own eyes as this is one of the most incredible wildlife experiences Africa has to offer! Permits for visiting the gorillas in Bwindi are currently set at 600 USD and around half price during the rain-soaked months of April/May, although you will be dealing with extremely muddy, slippery tracks. During the high seasons of June to September and December/January keep in mind that permits need to be booked well in advance. Plenty of water is a must as there is no guarantee how long your trek will be and trekking boots with good grip are necessary for the muddy trails. Wear long trousers (men, women) to protect your legs from scratches, antibacterial wipes, antiseptic, headlamp or torch, rain poncho and insect repellant to keep the bugs away. Above all, get a good nights sleep before you trek! Featured photo by Richard Ruggiero (Wikimedia Commons).